From the top HMS Cheviot – Cockade – Concord – Comus. 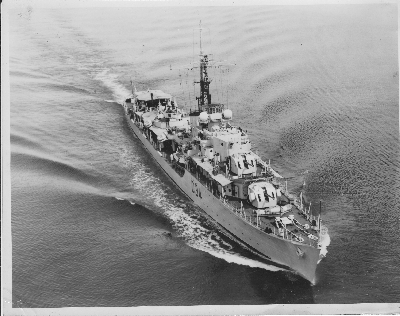 HMS Cockade was part of the 8th Destroyer Squadron, based out of Singapore. Her last commission was 1956-58 then we steamed her home to Devonport. Where she was later sold for scrap, a sad end for a once proud ship. In 1961 whilst serving aboard Taciturn we docked in Devonport for repairs. I spotted my old ship moored far up the creek. I took a launch and went for a visit, I walked around the dirty and rusty decks that once had been so spotless. It was a time of memories but sad too. Royal Yacht down to the OLYMPIC GAMES in 1956,and the ISLANDS we visited on the way back up to HONG KONG,for that refit in Dry Dock. I live in S Wales and I saw the ship being broken up in Cashmores yard in Newport, I used to pass her on my to work in LLanwern Steel works,where I probably helped roll her into sheet steel . What A sad end to a wonderful old ship. I must apologize for not remembering you? I do recall a couple of guys from Wales, Taff Richards and Bradshaw. they were both with me in the fo’ard seamans mess starboard side. I agree completely the last tour with Cockade was the best two years of my time in the Navy. It was in fact like a different Navy, we still used hammocks and there were at least three, three badge AB’s in my mess. After I left Cockade I never experienced anything similar. I walked the decks of the old ship in 1960, she was moored up the creek at Devonport. I took a small launch and went for a visit. It was very sad, just a silent empty dirty rusty old ship full of memories. I did end up in the South of Wales in 1959 at HMS Harrier in the village of Dale. A radar school that closed down shortly after I left. Good to hear from you, perhaps you have read my book “The Royal Navy & Me”its available as an book for $1.99 or at Amazon.com I give quite a bit of coverage to the Cockade. Hi Eddie I’m assuming you are in touch with pat line, stoker on Cockade NATO serviceman. My Dad (William “Bill” Sanders) was on Cockade from July 1956 to April 1958, he was rated Acting Petty Officer in September 1956. Elvis the ships monkey liked my dad & I have photos of him on his shoulder, I also have a picture taken off Cockade escourting the Royal Yacht to the Olympics in 1956 & with shipmates on the beach. Great to hear from you, sorry but I can’t recall your Dad, of course I was just a Boy Seaman straight out of HMS Ganges when I joined Cockade in August 1956. Petty Officers acting or otherwise seemed way above me in status. Cockade was a wonderful ship, I doubt you would ever find a crew member who didn’t enjoy that last commission. In two short years I had visited so many parts of the world. I still have my old photo album from then. Please send me a photo of your dad, I would probably remember him if I saw him. Which is the best way to send some photos please? Hi Fred, do remember you & just read & enjoyed your book which my daughter got me fo Xmas. I meet up with Danny,George Micky Slinger and a few others at the re-union every Oct. Best of regards & Happy Christmas Eddie Holmyard, Tel. Great to hear from you Eddie, you mentioned Danny, would that be Danny Gorman?? I was in touch with him a few yeas ago via email through his wife, I understand his eye sight is not good. Have you ever come across Phil Carroll, he was a Jack Dusty on Cockade and one of my best friends. I would love to contact him. Also you might remember Pat Line he was Nat Service stoker. He has written a book about Cockade but its not published yet. I did join the Cockade assoc in the 1980’s but being so far away it wasn’t really worthwhile for me. Hi I have just learned that my father Brian Frankcom served on the Cockade,He has passed away now,but was wondering does anyone remember him. Do you remember my Dad Jack Finnegan? Don’t know too much, he was a stoker, I have been to a couple of Cockade reunions, he was a keen football player, he played for Royton before joining up, he was also somewhat of a crooner and would sing A your adorable and so on, and another firm favourite my Grandfathers Clock. Names like John Whittle, Taff Jones, I am going to try and get to their reunion this year in Babacombe, so will be good to hear more stories, as Dad died 8 years ago. Hi Nicki If he played football then I would certainly have know him because we had a Cockade team called the Cockattoos. I remember on one of the Pacific islands we play a native team who played bare footed, they hammered us, not so much that we were bad, we were afraid of stepping on their toes and hurting them!! !One time we played against the British Army stationed in Malaya. None of us had football boots with us so we played in army jungle boots, we were hammered again 7-1. I remember the score because I scored the lone Navy goal!!! Aww thanks Fred, its great to hear the stories. Take Care and stay fit. Hello, My name is Ron O’Connor the son of the late Jim O’Connor who served in ‘Cockade’ in the mid 1950’s. Having looked at the photo of the ship’s company, the person standing in the second row from the back,far left certainly looks very like my father, but I can’t be sure.I wonder whether anyone could confirm this. Much obliged for your prompt reply,I’ll certainly follow up the leads you have provided. Anyone who may of known my father Trevor Martin Rank LEM ? I found his Korea I’d card dated 27/3/1954 I have a scrap book full of photographs with some very interesting shots, I know he served on Cockade amongst other ships. Unfortunately he died in 1992. Hi all My Dad Leading Seaman Les Jones served on Cockade From 1st August 1951 to 20th December 1952 during the Korean war. Dad sadly passed away in 1970 aged 47. Hi. My Dad, Max Skinley, served on Cockade, she was his first ship. He is in the ships company photograph, third row from the top, 4th from the left. Hi again Bob so sorry to hear your father has passed on, he was a good friend and shipmate. Its interesting to also hear from Eddie and to hear of Jamie (Chris Jameson) we were great friends who sat together on the train from London on the day we headed to Ganges for the first time, Jamie was coming from the Royal Hospital School and was in uniform, I was jealous because I was still in civvies. At the end of the years training we ended up together back in the Annex as Instructor boys, and later travelled together to Singapore to join Cockade. 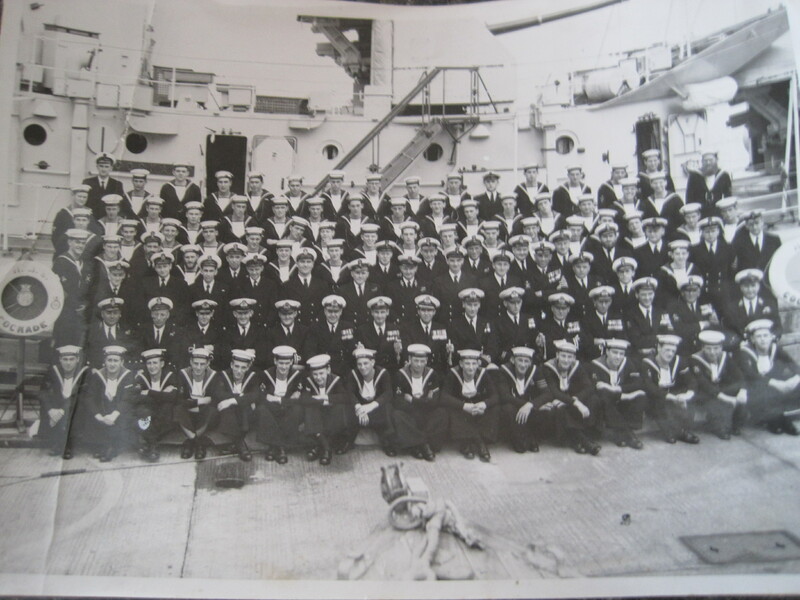 Because we came directly from Ganges via a few days aboard HMS Whitby we had no civvies just our uniforms. We couldn’t travel in uniform through the places we had to land to refuel. Not sure wear they got us clothes probably the Sally Army. We looked ridiculous in dreadful over sized ugly suits and wearing pusser black boots. Jamie was worse off than me as he was quite small. If you or Eddie would be kind enough to pass this message on and if Jamie is up to emailing I would love to make contact. my email address – irishrover1@live.com – I have lots of photos to share, but if you want to see them contact me via my email address rather than my blog. 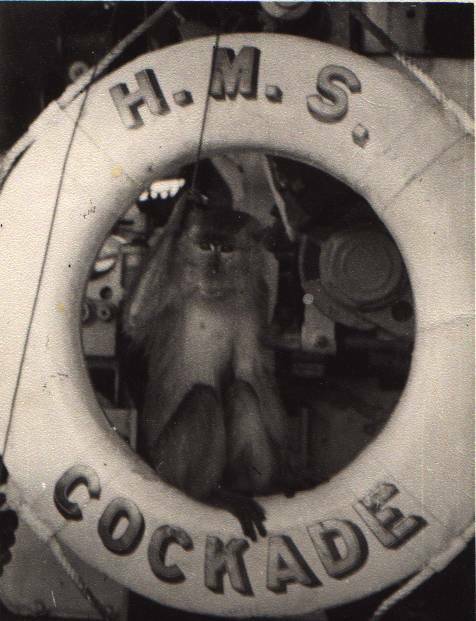 My dad was part of the first crew on HMS Cockade in 1945 . only had good story`s about HMS Cockade , he went out east with her to Hong Kong . Hello Ben thanks for the reply ,I wish my dad was still with us he would love to tell his story`s to the lads that followed him after 1947 when he was demobbed. Serving on a HMS Cockade was a a great time for him and his ship mates ,he always said it was a happy ship . I have a large picture of the Cockade on my wall at home ,also HMS Cossack doing high speed trials off the coast of Scotland . will try to get them to you . All the very best John . Hi,my dad Trevor Sutcliffe served on Cockade 1956-58.he was a PO, electrical branch.on His best freind on board was Bill Sykes. Dad once said to me that the Cockade was the best ship that he had ever served in,& he served a total of 27 years in the Navy retireing from HMS Vigilant @ Devonport in 1963. From the previous comments that i have read it would appear that Cockade was truly a happy ship. Dad passed away in November 1999. Firstly, thanks so much for running this site, I love to read first hand accounts of you lads who served in the old navy. My father Jack (Jan) Edgcumbe served on Cockade as an Acting PO (Seaman Branch) from Feb 47 to Oct 47. His records show “Tamar” as a notation beside this draft, possibly the ship could have been in Devonport Dockyard for a refit, just guessing though. My dad was a survivor from HMS Repulse sinking and served in many ships during his 27 years in the Navy. His last draft was President of the Senior Rates mess in HMS Drake. Hi John HMS Tamar was the shore base in Hong Kong. The Cockade was deployed to the Far East Station in 1946. Your Father could have possible been draft first to Tamar and then joined Cockade in H K. Cockade refitted in either Singapore or Hong Kong she didn’t return to Devonport until we brought her home for the final time in April 1958. A great ship full of wonderful memories. The only RN ship that I served aboard and had a hammock. no bunks on this old lady. Glad you enjoy the stories. Did you read my book “The Royal Navy & Me” ? He was due out side and was hoping to get work in the farm machinery industry in his native Norfolk? Charlie Hayward. RN stoker 1956–to–Mech 1 1979. 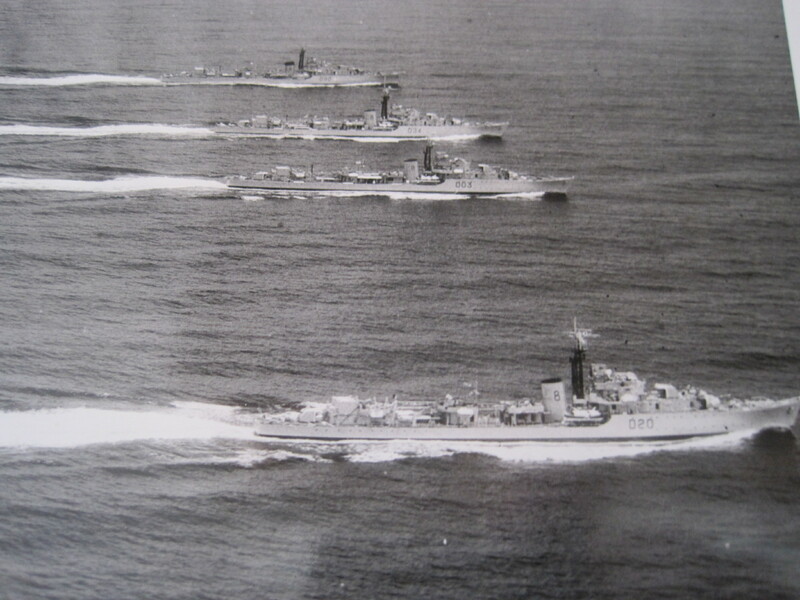 (HMS Tiger 1965). Sorry Charlie I can’t help you, don’t recall the name. I’ve just come across this whilst looking for some memorabilia for my grandad. He too served on HMS Cockade and loved it, only last week I asked if he ever served on any others and was amazed when he spouted off about 10 ships as he only ever talks about the cockade. My grandads name is Tommy Boden, known as Scouse on board, I have got pictures of him in his uniform that I could put on here if anyone knows him. I’m sure he would love to know this site exists!!! HI CARRIE-DAWN, just found this site. I am a pal of his and missing our reunions. Please give him my regards, we served together. Hi – I was a New Zealand Cadet Midshipman at the Royal Australian Naval College 56-58 and in 1956 it was sited at HMAS Cerberus in Melbourne. We spent some time in December, 1956 at the Olympic Games – and then returned to New Zealand for the Christmas break on Cockade – Melbourne to Bluff the southernmost port in NZ. We had a great passage sleeping on stretchers in the passageways (there were 4 of us). Then went on the BRNC Dartmouth 59-60 where the artmouth squadron consisted of Venus Vigilant and Urchin – similar destroyers/frigates. Great to hear from you Trevor, sorry but I have no memory of your passage aboard Cockade. I do remember the dockyard at Bluff and driving the olive green flat head Ford provided by the NZ Army. It was temperamental flooded easily and was always hard to start, nevertheless it made the trip to Invergaril shorter. You say you are long retired!!! I think we are all now long retired. I came across this site by accident and it was good to read, following contact by his son Robert, that Max Skinley, my brother, was remembered by some old shipmates from the Cockade. I think of all the ships Max served in, the Cockade was his favourite and he remained friends with Chris Jamieson until the end of his life. Max died in September 2013 and Chris died the following year – in January I think.. It was good to meet both Eddie Holmyard and George Hewitt at Max’s funeral. They were in this area on the way to the Cockade reunion and made a special effort to attend for which I and the rest of my family were very honoured. Max left the RN around 1978 as an SD Lieutenant as a result of a severe car accident in 1973 which ultimately contributed towards his death. Hi Peter so nice to hear from you, Max (we called him Joe)was a vert good friend of mine aboard Cockade and indeed I think the Cockade was every ones favourite ship. We had a wonderful time and saw more of the world in those two years than many sailors saw in a life time. I lost touch with so many after returning to the UK, and only recently thru Eddie learned of Max and Jamie passing. It was a big shock to my system as I still remember them as young men, I left the navy in 1967 and went to Canada where I later joined the RCN, I too retired as a Lieutenant!! who would have thought in 1956 we would have reached such dizzy heights back then we were just young boys..Please accept my belated and deepest sympathies for your loss. Joe and Jamie are greatly missed by all their shipmates. Memories! I am Eric Harris, a LSM on Cockade 1951. Some of the crew such as Jack Finnegan and Tommy Boden, the names above, have been meeting for years at a regular reunion. I remember Dennis Belleville well, he had the best beard on the ship! Hi, just been reading the blog and was touched that my Dad Jack Finnegan was mentioned. Sadly he’s no longer with us but loved his time on Cockade and the reunions meant the world to him. Reading the blog and so touched to see my Dad Jack Finnegan mentioned. Sadly he’s not with us anymore but HMS Cockade was a massive part of his life and the reunions were legendary! Fair to say Jack Finnegan was a party animal! I paid off HMS Tiger at Devonport 1963 and to my surprise, looking all forlorn was my first ship HMS Cockade, de commissioned and obviously on her way to the breaker’s yard.I was an EM when I joined Cockade in March 1955 after flying out from London with so many mechanical breakdowns it took us nearly a week.My name is David, Nicknamed Dan, Slowley.I am now 81 and have lived in Western Australia since 1970.I learned a lot, not only what I should, like canteen messing, sleeping on camp stretcher on the iron deck under the aft torpedo tubes because it was so hot in the messdeck.Names? I have forgotten them all except Chief Electrician George (Panhandle) Lucas and my old mate Jan Warne.We have a branch of the Royal Naval Association here in Rockingham. Good luck to my old shipmates who might still be alive. Hi David (Don) nice to hear from you although I must confess I can’t remember you from the crew. However, like you I saw the dirty rusty and sad state of Cockade moored up in the creek at Devonport. I actually took a(cicra 1962) launch out to the ship and walked her decks on last time, it was a very sad moment in my naval career. That wonderful old ship in such a dreadful state. So many fond memories of the last commission. I was just a young AB 18 years old. Lots of photos on my web page, perhaps you can pick yourself out of the crew photo taken in Hong Kong. I ended up living in Prince Edward Island Canada. Did you know my Farther Trevor Martin he was an Electrician? Hi Karl I can’t be sure as we all had nicknames in those days, if you send me a photo I may recognize him. Although after two years aboard I’m sure we were at least familiar with one another. Where can i send a photo? Come on Eddie you were always volunteering!!! So sad as our ranks thin, I recall as a member of the Cockade Assoc in the 1980’s we had so many members not only from our commission but the earlier ones too. Can’t remember his name but our Nav Officer became an Admiral with a knighthood, maybe is name was Wilson??? he attended one of those early reunions. My dad served as PO Cook on Cockade Ronnie Singer now no longer with us but served in Singapore but I believe flew out of Far East when new crew joined. Hi john it must have been an earlier commission than mine, 1956-58, we had no Singer listed in the crew. I just came across this site when searching for the ship my grandad served on for a while. I’ll have to check when exactly he was aboard though! His name is Bernie Stockton. I doubt you would remember him as it was so long ago but worth a try. He also served in some part of the SBS and later ran his own deep sea diving company – Maritime Offshore Projects. Hi Kathryn I checked the ships company list for 1956-58 and your Dads name does not appear, sorry I can’t be of more help. My father (Mo Blyth) served with Bernie on HMS Cockade and they often went to the reunions together. I lost his contact information a few years ago, how is he doing? My name is Neil Turnbull and I served on Cockade from approx. August 1957 until she paid off in Devonport in 1958. I was replacement for the original Coder who had returned to UK. I realise that we national service coders were not the most popular ratings aboard but I do have fond memories of my time aboard. Immediately after I joined the ship was put into dry dock for refit of a out three months. During this time we were all accommodated ashore. I can’t remember many names now but I recall the skipper Commander Cobb and Lt. Pike but not the name of my divisional officer who was also the gunnery officer. I recall the writer’s name is John Tomlinson(?). I recall vividly the journey home via the Suez where I believe we were one of the first British naval vessel to enter the canal under the Egyptian control and had to enter the canal last instead of the pre Nasser protocol of warships going first. I am now resident since 1969 in Hobart Australia. Neil I hope you see the response from Eddie Holmyard added below might be of interest. Thanks for your comments Eddie. The reason I had little to do with comms. is that within a day or two of joining Cockade we all moved to accommodation on shore who;e the ship underwent a three months refit in dry-dock. During that time I was seconded by Lt. Pike(?) to the ships office and remained there for the rest of my time on Cockade. In fact once I hard completed my training in cryptography at HMS Mercury I never saw another coding machine.